The Wabbit gasped. 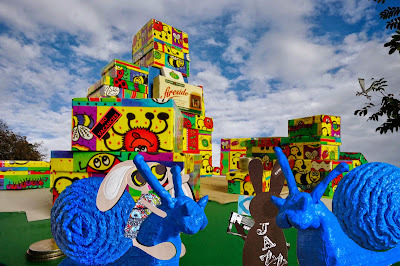 He remembered the MoTo Snails speaking of a Cardboard City and what a Cardboard City this was! All the same, this was a Quest and anything could occur. So he drew a Snazer gun from the secret compartment he'd designed specially for To. "Expecting to find trouble Commander?" asked Mo. The Wabbit grinned and every one of his 28 teeth gleamed in the light. "No. I expect trouble to find me." To glanced across the entirety of the city. "I don't like coloured cardboard." "It tastes of toxic," said Mo, "but I see plain cardboard over there." "Yum yum," said To. The Wabbit shook his head. "It may be an enemy playing a trick." "I hate enemies," said Mo. To snarled. "And the enemies of our enemies are dumpling heads." Lapinette nodded in agreement. "Let's look over there." "What for?" asked Mo. "I don't know," smiled Lapinette, "it's your Quest." Mo and To looked at each other and shook their antennae. "We seek the Holy Snail." Lapinette tried not to laugh, but the Wabbit simply said "There is none." Mo and To drew back. "What? No Holy Snail, you say?" The Wabbit held up a paw. "I mean the Quest is more important than the objective." The conversation stopped as staccato calls shattered the air. "Listen!" whispered the Wabbit. There it was again. "Naw, Naw, Naw." "Take cover in the cardboard!" yelled the Wabbit.